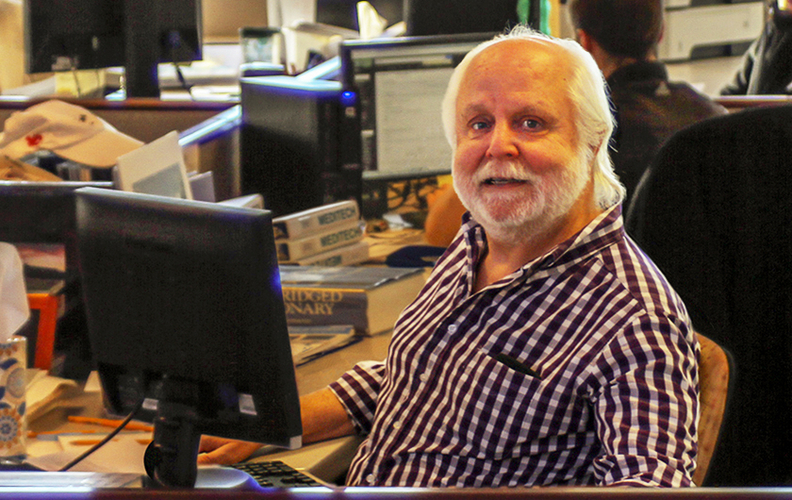 Answering the call of destiny is how health information technology pioneer, innovator and entrepreneur A. Neil Pappalardo sums up his career as chairman, founder and former CEO of Medical Information Technology, of Westwood, Mass. Even before he launched his electronic health records development company, more commonly known as Meditech, in late 1968, Pappalardo said he knew health IT would be his life's work. Pappalardo, now 73, is also known throughout the health IT community as the lead author of the Massachusetts General Hospital Utility Multi-Programming System, a database and computer programming language developed in the 1960s and more commonly known as MUMPS. Versions and derivatives of MUMPS are still used in healthcare and finance today. An inventor since high school—as a teen he developed a technique for measuring the growth rate of cancer cells—in college he developed the basic technology to speed up the reading of heart monitors. Pappalardo, still Meditech's chairman, relinquished his CEO role to long-time Meditech executive Howard Messing in 2010. In a far-ranging conversation with Modern Healthcare reporter Joseph Conn, Pappalardo spoke of his Sicilian family influences and early education in upstate New York, his technical training at MIT, his passion for invention, and his goal of conveying ownership of Meditech to its employees. The interview began with Pappalardo apologizing for asking Paul Berthiaume, the company's communications director, to bring him a cup of coffee. The following is an edited transcript. A. Neil Pappalardo: You may or may not have known I had a stroke 4½ years ago. And since that time, my whole ability to balance myself has been totally compromised. I had to learn how to walk again. Thank God for my physical therapist. I walk much slower than I used to walk, but the point is I walk pretty well, although everyone around Meditech sees me walking slowly and tries to assist me in any way they can, which I always dismiss because I hate to be waited on. Modern Healthcare: I've seen your name listed as A. Neil Pappalardo. What does the “A” stand for, and why did you stop using it? Pappalardo: I've never stopped using it. I lived with my grandparents, growing up in a Sicilian family on a Sicilian street in a Sicilian neighborhood in a very small village outside of Rochester, N.Y. I was a second-born son, so I'm named after my mother's father. His name is Antonino. And for some reason my father decided that he needed a raise. He was a clerk at a law firm in Rochester, so he went to his boss and promised his boss that he would name his second son after him. His boss's name was Neil McNerney; hence, I was named Neil. From the time I was 13, I always worked. I started working every summer for a Sicilian mason.I worked every summer until I graduated from high school. Then I worked for Bausch & Lomb, and I became within a month or two known as somebody that the older engineers who wanted to make a transition from tubes to transistors would come to, and I would design circuits for them. MH: Where did you learn how to do that? Pappalardo: I went to a Jesuit high school in Rochester. I learned starting in my freshman year all about works that had been done in the Manhattan Project, developing the atomic bomb, which included the design of all kinds of circuitry to build radiation detectors and started getting heavily involved in science experiments. MH: Was there a teacher who was a mentor in high school? Pappalardo: There's always a teacher. I only took two years of math in high school and no science whatsoever. This one Jesuit brother decided that my knowledge of science and technology far exceeded the average, so he taught me independently after school on science projects. He guided me on my last science project, developing a technique to measure the rate of growth of cancer. I had an idea, in my junior year, if I could inject a radioactive isotope in mice that have a particular type of cancer, I could effectively measure radiation per cell. The atomic cell splits; half the radioactivity in the mother cell would be divided into two. So, by noticing the amount of activity per cell over time, I could tell the growth rate. I wrote up a science project for the Westinghouse Talent Search and became a finalist. MH: Do you think you were by nature entrepreneurial? Pappalardo: It was mainly the encouragement my mother, in particular, gave me about the devices I would build from hobby magazines. She always would point out to me that if you could make something that was useful to society, you could start a business. She said that to me many, many times. MH: Your high school education focused heavy in classical languages. Would that preclude you from being admitted to the Massachusetts Institute of Technology today? Pappalardo: I eventually hitchhiked from the Rochester area to MIT for my first visit and was shocked when the admissions director, or one of his workers, pointed out, “You're not particularly qualified to come to MIT,” because I didn't have the normal requirements of science and math. But I do have what we would call bravado . . . and I said, “The best thing you could do is admit a classical scholar like me who brings a little bit of culture, but more importantly, humanity to MIT.” I was fortunate; I got an 800 in math (on the SAT) and I did in the mid-700s on the verbal side. But I guess the science project I did on the growth rate of cancer, I was told, was the primary reason that they wanted to accept me. MH: I attended a birthday dinner party for MUMPS in Boston in April 2005. Dr. G. Octo Barnett was there. You went to work for Barnett after graduating from MIT, and he had even talked about it at that dinner, saying that you had pestered him about creating a new language, and he didn't like the idea. He said he threatened to fire you if you didn't stop asking him about it, but he admitted that ordering you to drop the idea was the worst management decision of his career and was happy you didn't listen. What's your remembrance about creating MUMPS and Barnett's reaction to it? Pappalardo: Well, that story is true in a sense that he claims to have fired me two or three times. I met Octo at what's now Brigham and Women's Hospital in Boston, because for the thesis I wanted to do at MIT, I needed some guidance from a physician. The thesis had to do with developing a special purpose computer to analyze EKG arrhythmias. I developed an electronic device to do it at essentially 24 times real-time. And after I graduated, I joined him at the hospital to continue my work with this device, which I eventually passed on lock, stock and barrel to American Optical. Within a month or two of that summer of 1964, Barnett got a job at Mass General Hospital to be the co-director of a hospital computer project that had been started two years before in a joint effort with Bolt, Beranek and Newman (an acoustics and computer consulting firm known as BBN). That's how I learned my whole trade, by talking to them, reading some of their progress reports on this hospital computer project using Mass General as a test bed. They had developed one of the very first time-share computer systems. And they thought, properly so, that you could solve clinical problems in a hospital if you have an interactive computer system. Interactive in those days meant teletypes. If you could develop a simple language to do this—and that programmers could easily use—they could quickly develop what BBN said they were going to develop. Barnett didn't like that. He thought I was wasting my time and didn't think I could do it, and he ended up ordering me not to do what I set out to do. But after a while I knocked off my first language in perhaps a week. Many people will look at it and say, “Wow, that must take a long time.” It doesn't take very long. I know how to make things, so I know how to program them. I consider myself extremely innovative. MH: Where did that come from? Pappalardo: It just seemed to be part of my overall destiny. My first electrical engineering course was taught by Amar Bose. (Bose founded consumer electronics manufacturer Bose Corp. and taught at MIT for 45 years.) He would invite us down after the class into his lab. What he worked on was making tiny speakers that could produce sound that up until that point could only be produced by large speakers as part of stereo systems. Amar was the first person who created a vision for me of how to make something that had never been made before. MH: When you look back on critical points in your career and the history of your company, is there a spot you can look to and say, “I had this saving grace”? I would need two computers (at about $150,000 each); hence, I needed twice the amount of money. One I'd use for the development of the applications, and the other one I'd use to execute applications for customers, which I would connect via phone lines to a hospital, to put a teletype at the hospital. I'd let them try the application software that I intend to sell to them before they make a big capital decision to go buy the computer and pay for the software. MH: Do you have a core leadership philosophy? Pappalardo: My whole philosophy is if I do something and it burns my hand, don't ever do it again. If I do something and it feels real good and it didn't burn my hand, if in fact it seemed to have worked, I continue doing it that way from now on forever. Early on we couldn't hire anybody who had experience in the software field. Why? There wasn't anybody who had experience. All we could do is employ young people who just graduated from school. So, we still hire entry-level people to this day. Everybody is homegrown here at Meditech. So, there's an example. Why wouldn't we hire anybody with experience? Because when I first did it, it worked, it didn't burn my hand. I lead—I like to think—by inspiring people to do what I set out to do many, many years ago. I want our company to make sure hospitals and clinicians do the right thing to the right person at the right time and be good at providing systems that help hospitals do that. Our stuff is pretty good at minimizing errors due to too many people working on too many patients simultaneously. I think people around Meditech have a certain amount of pride. We've helped improve the health of tens of millions of people every year. It's a nice feeling. MH: How long do you plan to continue at Meditech? Pappalardo: Until I die. I hope and pray I die suddenly at my workstation. It's clear the best of my innovative work is behind me. I personally am very excited that the decision was made, perhaps because I had a stroke, that the company did not have to do software the way I would have them do it. Instead, the company, with a little bit of advice from me, decided to reprogram everything as we have always reprogrammed everything, but this time do it so it executes on a browser. Pappalardo: Yeah, the first one was an ambulatory system that interacts directly with clinicians. They can use their desktop and a mouse or they can use a tablet and their fingers to touch. We will soon follow with acute care. MH: Your company has stayed defiantly private all this time. Pappalardo: Private is not a good word. I would like to say that Meditech is an employee-owned company. My desire at day zero was I wanted the people who work here, the people who produce what we produce, to share in that ownership. So, I set upon a rule from day zero, I wanted essentially 1% of the ownership to transfer to the staff every year. So, here we are 45 years later; 45% of the company is owned by the staff. I'm 73, so will I make it to 90? I doubt it, but I should make it to 80—that dream of allowing the company to be owned by the staff—as long as I can transfer one way or another 1% of ownership to the staff every year, I'll accomplish what I want. MH: What do you see as the biggest challenge for your company in the next couple of years? Pappalardo: The real issue for Meditech is we have to do what we have been doing for the past 45 years—constantly redevelop our application software. We can't wait until our customers demand it of us. We must have it done so that it's finished and can be introduced when they want it. That takes time, and it takes the right decisions at the right time.